We purchased Dirona, a Nordhavn 52, with a plan for world-cruising and rigged the boat with that in mind. In the years before placing the order, we built a long list of desired equipment and functionality garnered through reading, attending boat shows, experience on our previous boat, and discussions with other cruisers. 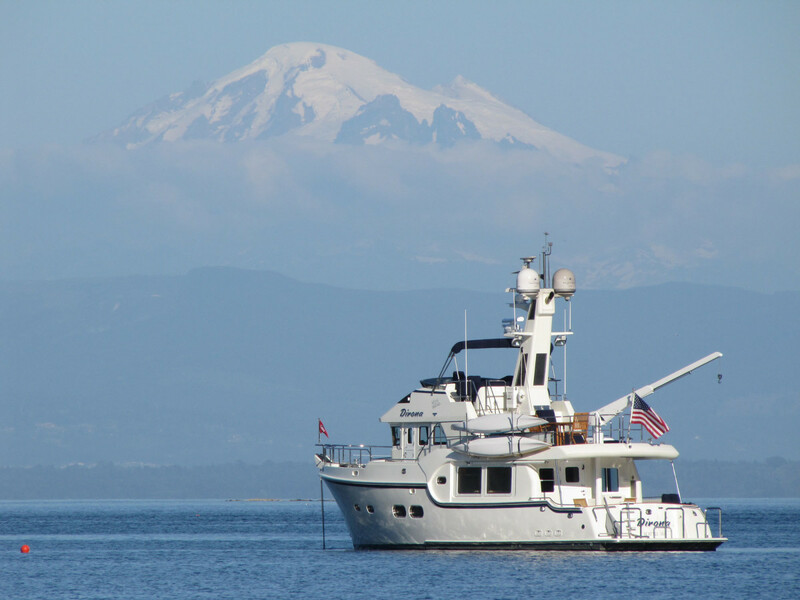 We equipped the boat with most of the gear on our list prior to leaving Seattle in 2012, have used almost everything since, and have made relatively few upgrades along the way. Of the few items on our list that we didn’t install, we later learned that some of these choices probably would have been a bad call. This is the third article in a three-part series describing our trip around the world on Dirona. The first article (“56,000 Miles and Counting,” PassageMaker, April, 2017) covered trip planning and various aspects of being underway; the second (“Ducks in a Row,” PassageMaker, May/June, 2017) describes how we made the logistic complexities fade into the background so we could enjoy the trip; and this final installment covers how we rigged Dirona for the journey, with emphasis on gear needed outside our home cruising territory of the Pacific Northwest. Shore-power connections vary greatly among countries. We brought several pigtails with us to build adapters as needed. Our main power cord plugs into one end of the pigtail and we wire a country-specific connector to the other end. Dirona is a 60Hz boat. This utility power frequency is common in North America and some parts of Asia, but most other parts of the world use 50Hz. Operating equipment outside of its frequency range may damage it, so we designed the power system to be able to isolate the house electrical loads from shore. The boat has high-capacity, frequency-invariant chargers and sufficient inverter capacity to run all the appliances. In 60-cycle countries, the shore power supplies the boat as usual. In 50-cycle countries, the shore power feeds the chargers and the house runs off the inverters. A detailed description of our power system is in the April 2016 issue of PassageMaker. James wires a custom shore-power connection. Beyond frequency, shore-power connections vary greatly among countries. To avoid replacing our main power cord plug as we traveled, we brought several pigtails to build adapters as needed. Our main power cord plugs into one end of the pigtail and we wire a country-specific connector to the other end. 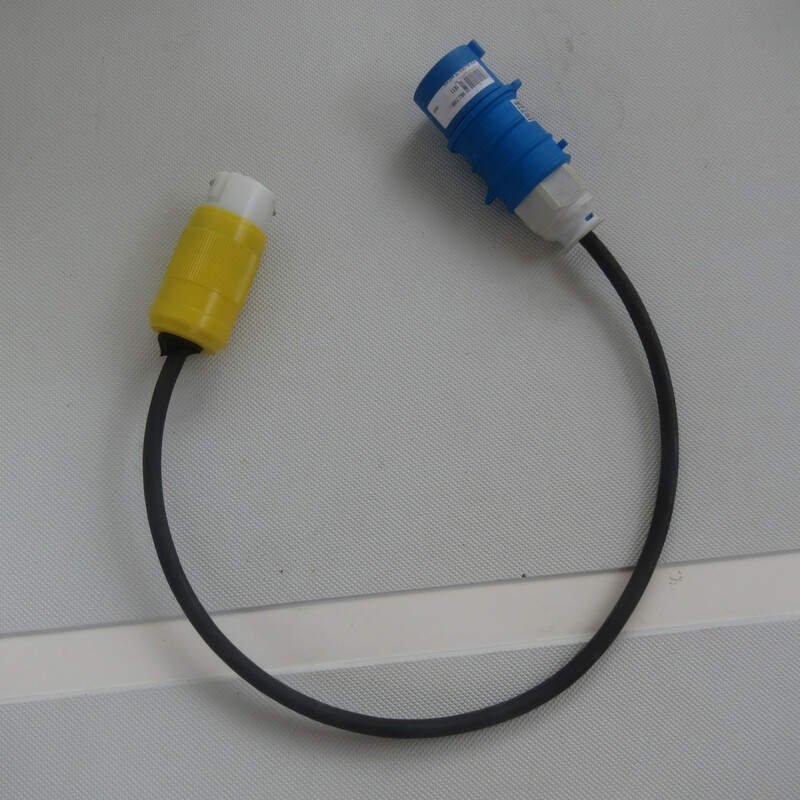 Sourcing the connectors locally was easy, much more so than trying to determine and obtain the part in advance. 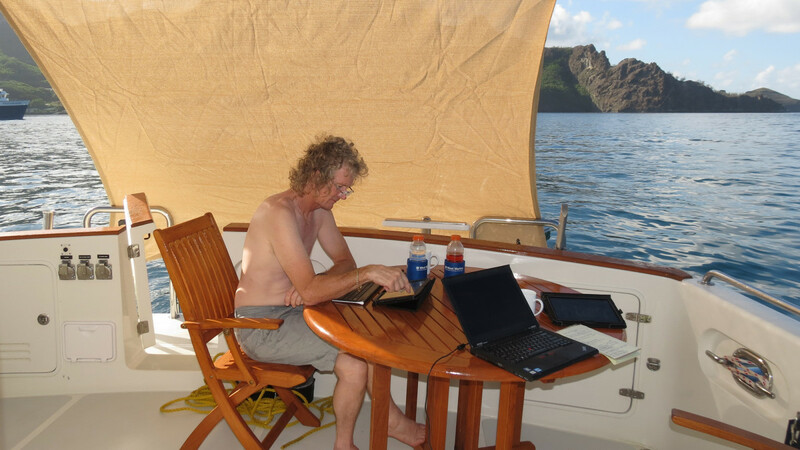 For example, we ended up building three differing adapters for the same marina in Papeete, Tahiti, which surprisingly had 60Hz power. The marina lent us one adapter, and we bought the other two at a local marine chandlery. These latter two adapters ended up being compatible with most the other places we took shore power in the southern hemisphere: Fiji, New Zealand, Reunion, and South Africa. Australia was the only stop in the region needing a different connector. Something we hadn’t considered prior to leaving is that water-faucet threads are metric in most countries. Our U.S. hoses didn’t attach properly and leaked water at the connection. Gardena quick connectors are common in New Zealand and Australia, and are compatible with U.S. parts. So we added U.S.-sourced connectors to all our hoses and purchased metric connectors in New Zealand to screw onto local faucets. ProStock Marine inflatable fenders are big enough to protect the boat on docks exposed to surge and strong enough to handle rough concrete walls for years. Many docks we tied to around the world were exposed to surge, and sometimes we were up against a rough concrete wall. These conditions require large fenders and strong lines to protect the boat, and lots of anti-chafing gear to protect the lines where they rub against the wall. Large enders are a pain to stow, however, so we went with inflatables. The first brand we bought developed seam leaks after a short period of use. We eventually switched to ProStock Marine, with welded rather than glued seams, and they’ve performed flawlessly in extreme conditions. We carry six of the 18×24 and two of the 24×42 sizes and included them in the pallet we shipped to Australia in 2015 (see “Ducks in a Row,” PassageMaker, May/June, 2017). We can quickly inflate and deflate them with a portable vacuum cleaner, and they take up relatively little space in the flybridge brow. After years of use and abuse, we have never had a single leak with these fenders, whereas every fender from the previous supplier leaked. To secure the boat, we ordered 25- and 30-foot, one-inch dock lines with anti-chafing gear around the eyes and partway down the line. We’d been warned to also carry additional anti-chafing gear to protect the lines. We did, and went through it so quickly we ended up buying more partway through the trip. We initially purchased sleeves in one-foot lengths, but switched to four-foot sleeves as these provided superior coverage. Another way to protect the lines is to run short lengths of chain from the dock across any points where the line might rub, and attach the dock lines to the chain away from the dock. We do carry these chains, along with shackles to connect them to the eyes of our dock lines, but find anti-chafe more convenient and simpler to use. We carry two 75-foot, one-inch dock lines that have been useful on a number of occasions, such as stabilizing the boat in a super-yacht berth in Barbados..
We also carry two 75-foot, one-inch dock lines that have been useful on a number of occasions, such as Med-mooring off an open-roadstead in heavy swell to take on fuel in Nuku Hiva, French Polynesia. 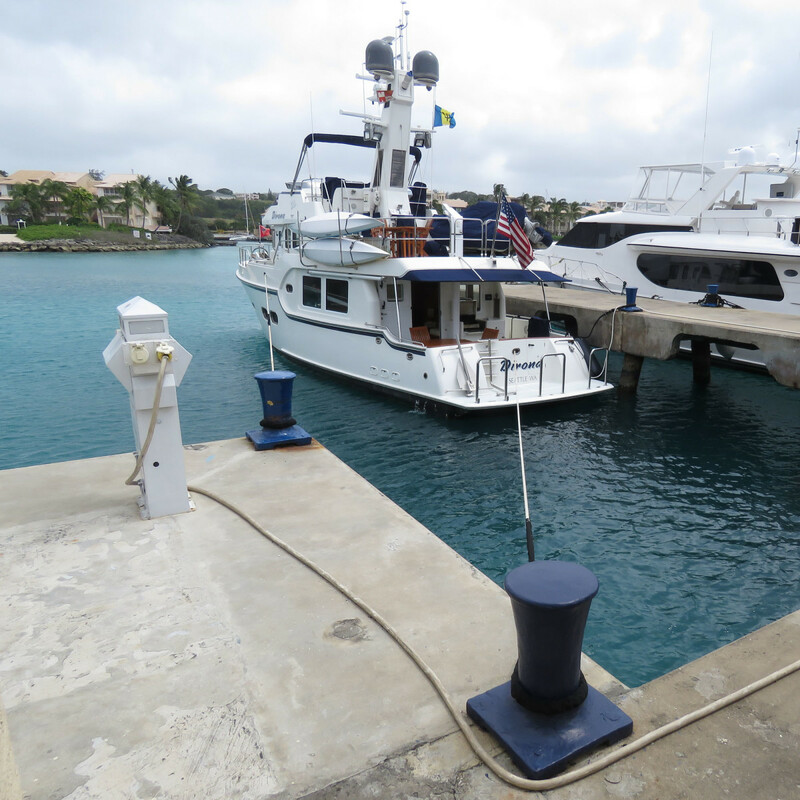 The second use was to stabilize the boat in a superyacht berth in Barbados. We have these lines somewhat by accident. Our main ground tackle is a 154-pound Rocna with 500 feet of 7/16-inch chain, and we carry a 42-pound Guardian anchor as backup. For a backup rode, the best price we could find for 450 feet of three-strand nylon rope was a spool of 600 feet. This left us with 150 feet to spare, so we had a rigger cut it in half and install eyes and anti-chafing gear. We also have four lighter-weight, 150-foot lines that we expected to use for large canals like Panama, but so far haven’t needed. On occasion, the only docking option is against several widely spaced vertical pilings. We built fender boards for this purpose, using schedule 80 PVC. 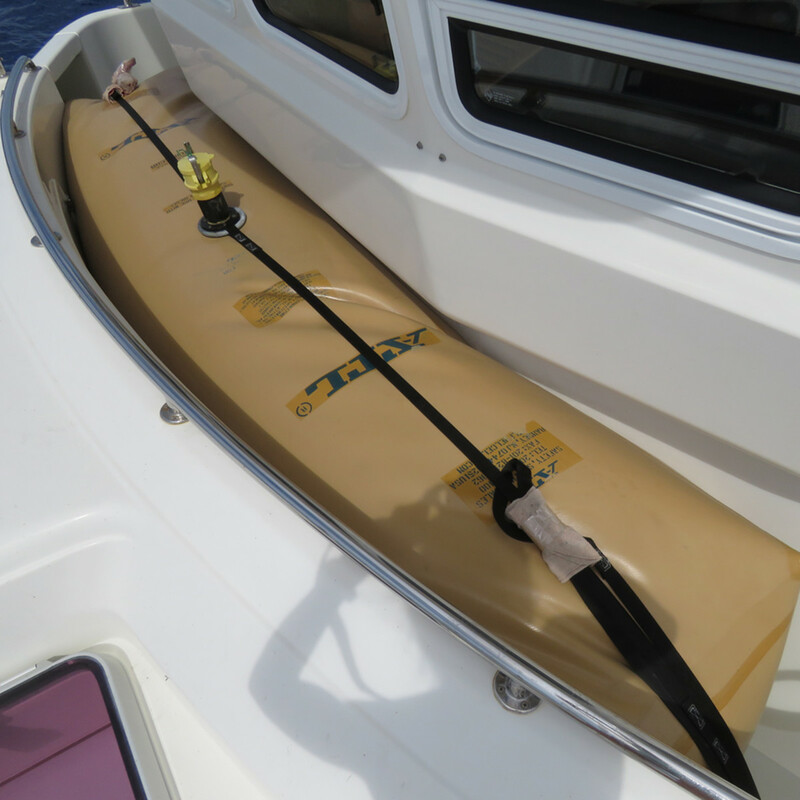 Fender boards hang horizontally between two or more pilings and the fenders on the boat, allowing the boat to shift position fore-and-aft with the fenders falling between the pilings. Fender boards also can protect the fenders when moored against an abrasive cement wall. Most people build fender boards from wood, but we went with PVC, as it’s lighter and doesn’t rot or splinter. Our fenders are large and can be hung sideways so we’ve only used the fender boards once, in Dunedin, New Zealand, but we really needed them there. We stow our four five-foot boards under the tender on the boat deck. 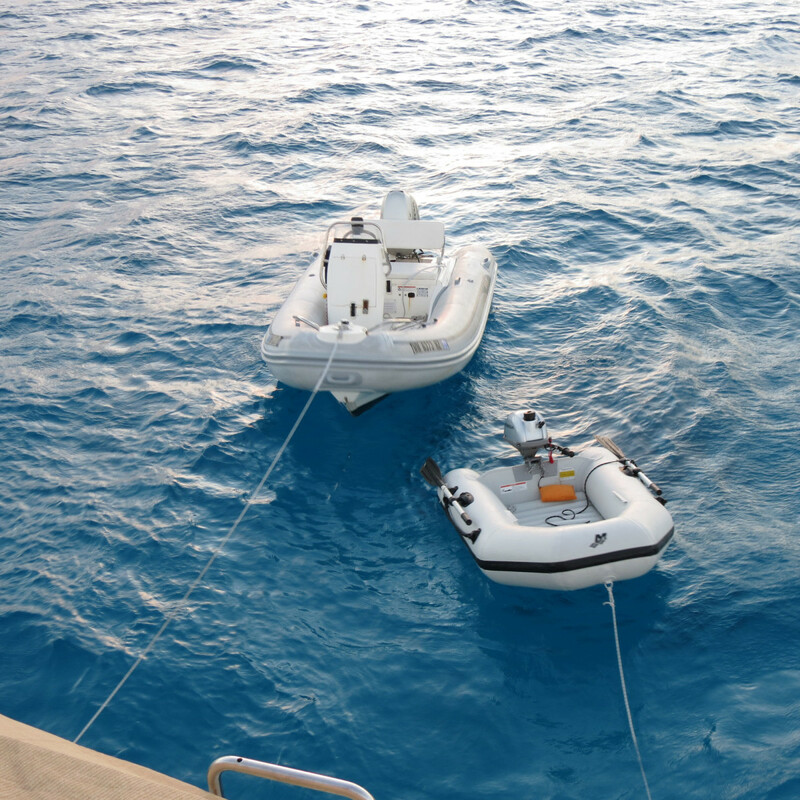 In many countries, particularly in Europe, space is at a premium and boats are moored stern-to the dock with a bow anchor down, a practice known as Med-mooring. This mooring method stands the boat off from the dock, so we specified a Besenzoni aluminum passerelle (gangway) with a socket in the swim step and in the gunwale. One end fits in the socket and the other rests ashore on wheels. The gunwale socket is used for high docks and the swim step socket for lower docks. 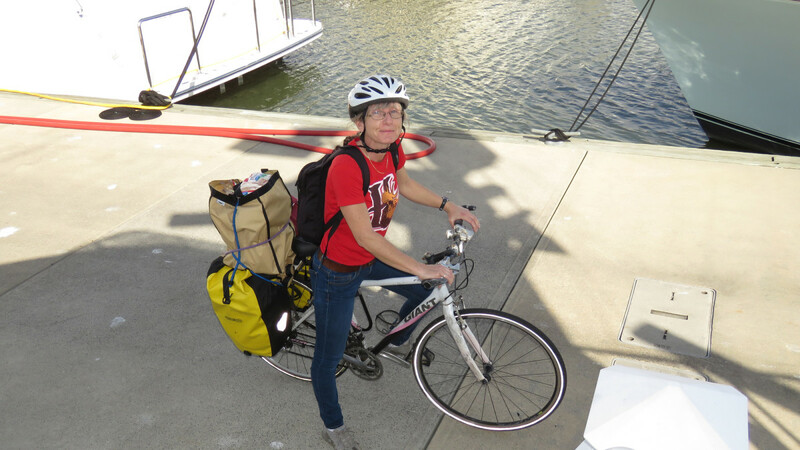 In 2009, when we first moved aboard our previous boat in Bell Harbor Marina in downtown Seattle, we bought Giant FCR-2 bicycles. We purchased them mainly for exploring farther from the boat, and they’ve been great for that, but the bikes also ended up being invaluable for living without a car in downtown Seattle and while traveling the world. With rear cargo racks installed, the bikes can carry a huge amount. Some of the crazier things we’ve transported include a full-size dehumidifier, a propane tank, and two 600-foot spools of line. Each of us has a pair of Ortlieb rear-rack waterproof panniers whose large carrying capacity is ideal for grocery shopping. The bikes have performed wonderfully and needed surprisingly little maintenance, given they’ve traveled around the world on our flybridge. We store them in a custom canvas cover and the only regular maintenance they’ve gotten is heavy chain lube every few months. Our Giant FCR-2 bicycles have been invaluable for living without a car. With rear cargo racks installed, the bikes can carry a huge amount. Here Jennifer is returning from a grocery shopping trip with a pair of Ortlieb rear-rack waterproof panniers stuffed full. James hauling oil in the Tipke 2100 folding cart. A last-minute purchase before we left San Francisco for Hawaii was a Tipke 2100 folding cart that turned out to be much more useful than we expected. Many of the marinas we’ve visited don’t have dock carts, so having our own is handy. In Brisbane, for example, the marina had no carts and was at least a five-minute walk from any road access. 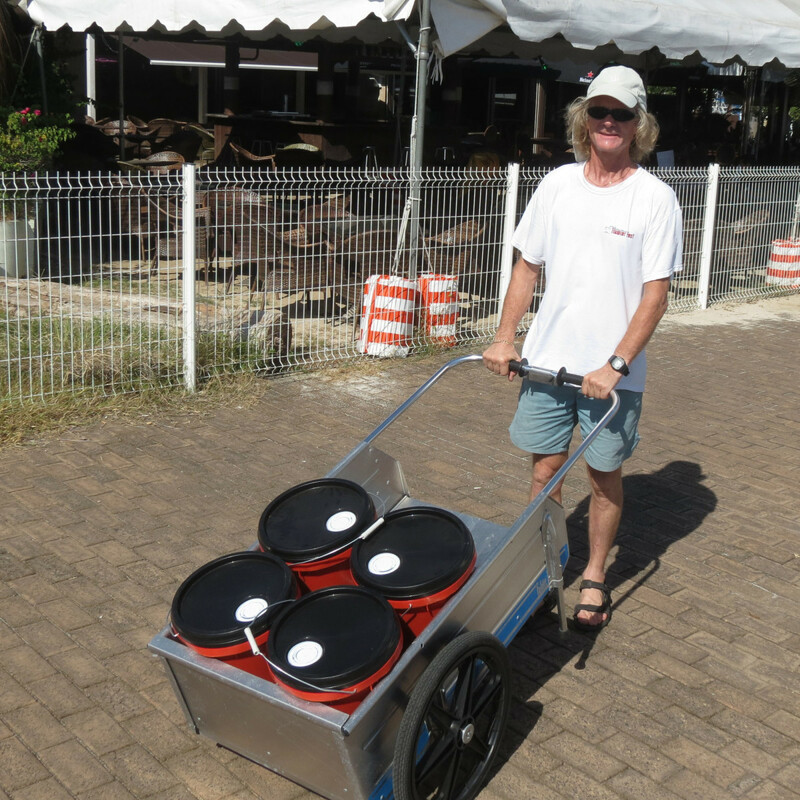 We used the dock cart to transport four five-gallon pails of delivered oil. Jennifer has taken the cart on countless grocery trips, and, if we’re at anchor, sometime also a dinghy ride away. Like the bikes, we keep the cart stowed on the flybridge in a custom canvas case, which looks better, makes it safer to move the cart around without damaging the boat, and keeps all the loose parts secure. The cart is also a great conversation starter—we always get questions about it wherever we go. We also have a dozen or so EarthTote Reusable Bags. They can handle heavy loads, so we can pack them to the top. When transferring groceries to the boat (and sometimes to the dinghy first), it’s much more convenient to have a few large, sturdy bags than many smaller ones that might rip. The bags also are great for loading the folding cart to maximum capacity. We bought a 12-foot AB tender for Dirona before even taking delivery. It was excellent for high-speed, rough-water winter runs between our home port and Elliott Bay Marina where Dirona was commissioned. The deep-V hull handles heavy seas well, and it’s a sturdy platform for diving and generally touring around. A 30-knot tender that can handle heavy seas and cover long distances is a great partner for a slow, oceangoing boat. We frequently explore as far as 30 or 40 miles away from Dirona in the tender. It’s also big enough to carry our bicycles. We’d likely buy a similar model if this one needed replacing, but would consider the lighter aluminum hulls instead of our fiberglass model. Another AB feature we like is the thick rub rail all the way around which protects the tubes when we’re tied off against a rough wall or dock. We often use a Tuggy Products Anchor Buddy (a bungee cord that attaches to an anchor) to keep the dinghy in deep water in tidal areas or to pull it away from a busy or dangerous dock. 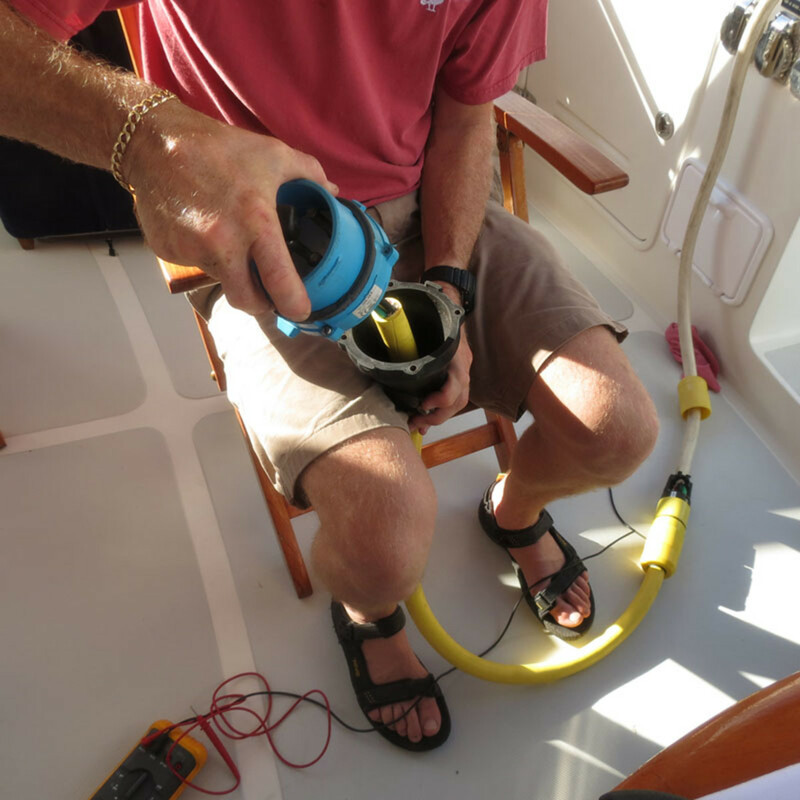 We installed a depth sounder that is useful, for example, in locating wall dive sites and keeping a close eye on depth as we work through shallow water. 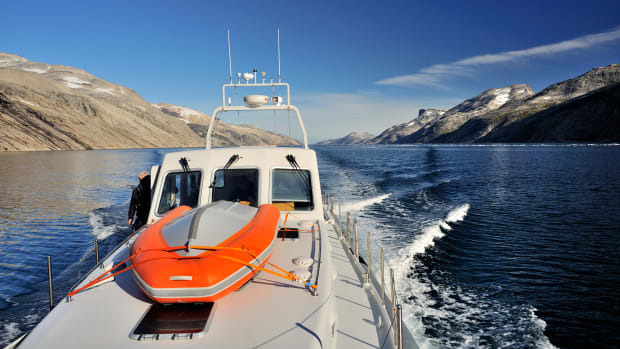 Dirona carries two tenders; a 30-kt AB Tender which gets a lot of use for exploring and transportation as well as the micro-tender which comes in handy in many situations as it is more manageable. The AB’s size and weight provide many of the features we like, but they also are a disadvantage. Other cruisers had told us the big tenders common in the Pacific Northwest just aren’t suitable for beach landings in the South Pacific, but we figured we would simply make do. After nearly capsizing the 850-pound beast in the surf off Maui, we realized they had a point. In Honolulu we bought what we call the “micro-tender,” a Mercury 6-foot, 7-inch inflatable with a 2.3-horsepower Honda motor. We can deploy and stow it quickly, and the whole package weighs just under 70 pounds. We can carry it between us, over reefs, or up a beach through surf to tie it on shore out of the tide’s reach. We’ve even drift-dived with it in French Polynesia, towing it 100 feet above us on a long line. As an experiment, we’d gone with as small as possible, but the Mercury was a little tight for space, a bit of a wet ride, and wasn’t very stable, both initially and directionally. When we saw the next larger size on sale we couldn’t say no. The new micro-tender is 7’ 10”, weighs only eight pounds more, and stows in the same place in our lazarette. It has much more interior space, is a dryer ride, and is more stable. We love it. We took delivery of Dirona in February of 2010. While we did test the boat in Puget Sound gales, we didn’t try open-ocean conditions until making an offshore run directly from Seattle to Southeast Alaska that August. During those first few months, we’d not felt any need to use the factory-installed active stabilizers and were beginning to wonder if they were a waste of money. We try to test extreme conditions as much as possible, to learn how we and the boat handle each situation. During that offshore run to Alaska, while running comfortably in a large beam swell, we decided to test how the boat would feel with the stabilizers off. “Turn them back on! Turn them back on!” we both yelled as the waves began to roll the boat through twenty degrees and more. 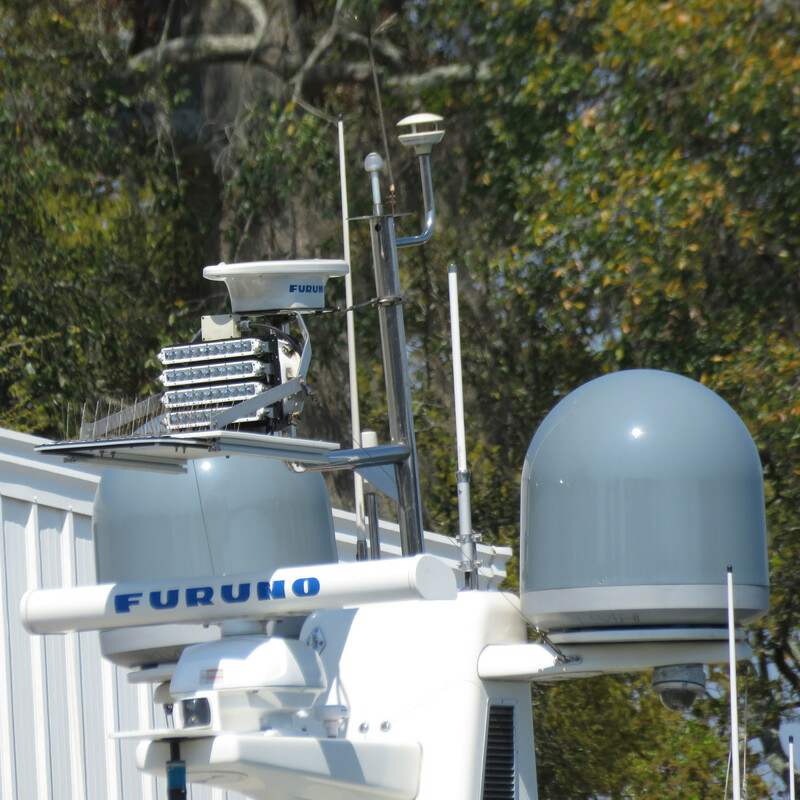 One particularly nice feature of our ABT stabilizers is that a failure on one side doesn’t disable the entire system. We can continue running on one fin, which seems to provide about 70% of the stabilization of the fully operating system. They’ve also been reliable. In 8,738 engine hours and over 60,000 miles, we’ve never had to run at sea without stabilization. Our flopper-stopper (passive at-rest roll stabilizer) is another piece of factory-installed gear that we’d tested in Puget Sound but didn’t feel any need to use until nearly two years after delivery. 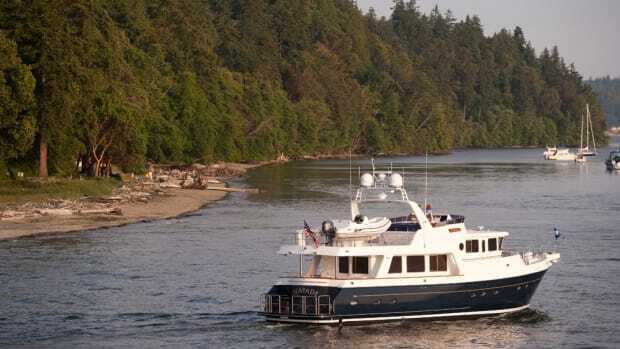 The anchorage choices in Puget Sound through to Alaska generally are so good that few would consider anchoring in an open roadstead exposed to ocean waves and swell. Many of the anchorages in the South Pacific, however, are merely small indentations along the shoreline, exposed to wind and swell. We’re not particularly sensitive to boat motion and the first time we needed the flopper-stopper wasn’t even for our own comfort. We were anchored at Nishimura Bay, a small cove at the northeast corner of the Big Island of Hawaii. We hadn’t realized how big the swell was until we tried to launch the tender and it swung dangerously when we got it into the air off the chocks. We didn’t feel comfortable launching it with that much motion and the flopper-stopper made a huge difference. We probably only use the flopper stopper two to four times per year but, when we do need it, it’s a great option to make an otherwise annoying anchorage comfortable. We generally keep the boat ready to go at a moment’s notice, with drawers all latched and loose items stowed. We’ll do a bit more preparation when we’re heading out on a multi-day passage where we might see rough weather, but the boat is always ready for most conditions. To reduce the chance of a window failure should we take a large wave or a knockdown, we cover the five large saloon windows with Lexan storm plates before leaving on any trip through unpredictable water or longer than a reliable weather report. To reduce the chance of a window failure if we take a large wave or a knockdown, we cover the five large saloon windows with Lexan storm plates before leaving on any trip through unpredictable waters or longer than a reliable weather report. The plates screw into sockets on the window corners and are easy to install—we install them in less than 20 minutes. We stow the plates beside the stack on the boat deck, in a canvas cover. We also have deadlights, metal covers that screw into the interior of the porthole, for the eight along the sides of the boat. 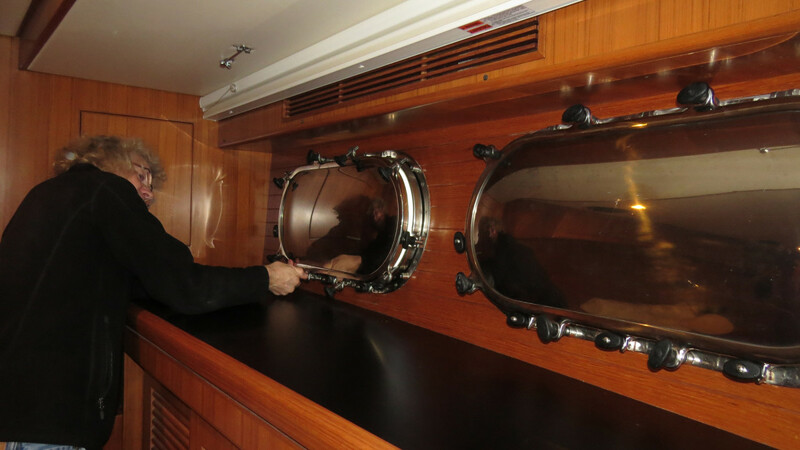 Deadlights for the master stateroom are particularly important because the portholes there are large and close to the waterline. We keep them stowed low in the engine room. We have deadlights, metal covers that screw into the interior of the porthole, for the eight along the sides of the boat. Deadlights for the master stateroom are particularly important because the portholes there are large and close to the waterline. The Nordhavn 52 comes with barrel bolts to secure anything without a latch that could swing open underway, such as the fridge door and freezer drawers. We upgraded these to airplane lever latches and added more to our heavy sliding pantry cupboards and any heavy drawers with only push-button latches that might not hold in extreme conditions. The levers are much easier to use than the standard barrel bolts, so we often use them underway locally. When we rolled 69.1 degrees in Australia, we likely would have suffered significantly more damage without the lever latches deployed. We’d run at night before, but never overnight before purchasing Dirona. In Seattle, we realized our navigation monitors were too bright for night running, even with the brightness turned all the way down and the chart plotter in night mode. We ordered custom acrylic covers with auto-tint film, which drop into place and are secured with heavy-duty Velcro. With the monitors dimmed properly, other light in the pilothouse became more intrusive. This was less noticeable in areas with ambient light, but a problem on passages far from shore. VHF radios, autopilot, stabilizers, FLIR, and hydraulics control panels were too bright, but these have built-in dimmer controls that reduce the brightness sufficiently. The only thing remaining is a non-dimmable small red light on the Mathers control. That’s solved with a double layer of blue tape over top. We mounted a floodlight high on the stack with a marine board shield under it, and another shield under our steaming light, to ensure no light shines on deck and impacts our night vision. At night we’ve spotted the floodlights of fishing vessels over 10 miles away, but our running lights likely aren’t visible for more than a couple of miles. For forward visibility, and to be more obvious to distant vessels, we installed a floodlight mounted high on the stack. For night vision, it’s important that any exterior light not shine on the deck or rail. We added marine board shields underneath our floodlight and steaming light to ensure the entire boat is in shadow. A final piece of gear we’ve found useful for night navigation is a Fujinon 14x40 image stabilization binocular. Stabilization gives a much clearer image in a rocking boat and it allows higher magnification to be used. If you have never tried an image-stabilized binocular in a boat, give it a try. For security reasons, we keep the doors locked and any person-size windows closed at night or when we are away from the boat. To help keep the interior comfortable in hot weather, we carry four Honeywell table-top air circulating fans. They are quiet and move a lot of air. We initially used them underway in the tropics as well, but with our new power system we run the air conditioner when underway, at the dock, and occasionally when at anchor. Many Nordhavn builds include phantom screen doors installed inside a teak frame, something we didn’t specify and regretted later as our tropical cruise neared. We subsequently found a local Seattle installer that did an excellent post-build installation for us. 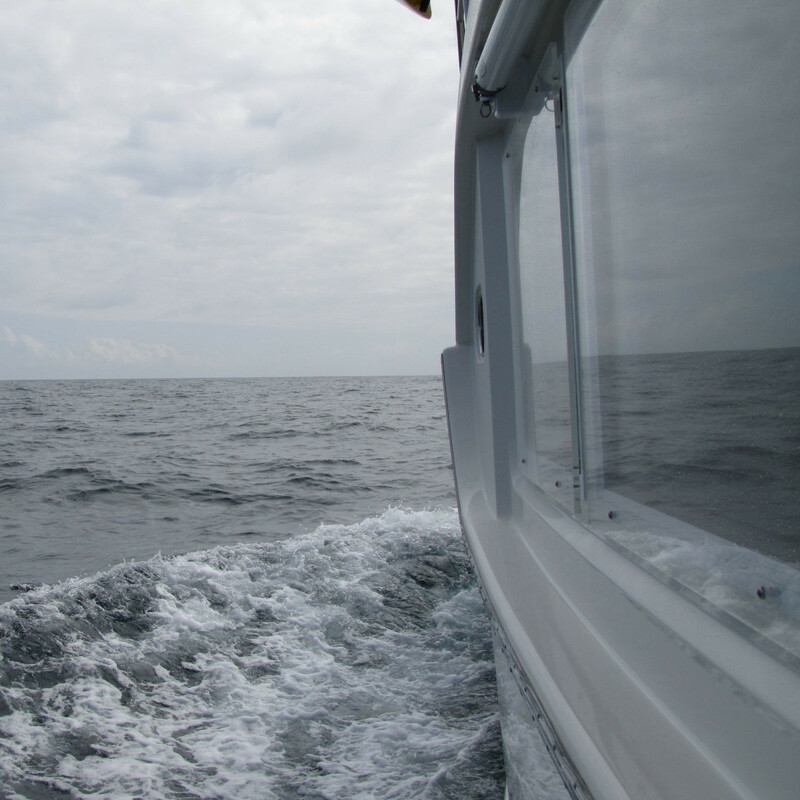 The screens keep out the bugs at anchor, are barely noticeable when not in use, and take up less space than those installed with a teak frame. We also find that the screens provide ventilation without allowing our cat unsupervised access outside. He’s not as good a swimmer as he thinks he is. In Hawaii, we realized the cockpit eyebrow bimini wasn’t sufficient for tropical cruising—we needed a way to shade the whole cockpit when the sun is low in the sky. We bought a Coolaroo Square Shade Sail that we string between the boat deck rails and the swim step staples. We can deploy and pack it away in minutes. The “roo,” as we call it, takes the cockpit from intolerably hot in direct sun to quite comfortable. 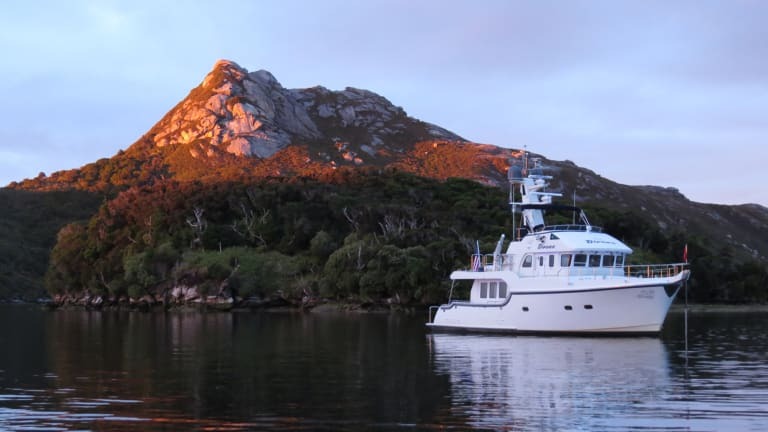 We looked at many brands and models before settling on the Nordhavn 52. We wanted the smallest ocean-capable boat we could comfortably live on that also could carry all the equipment we wanted to install. 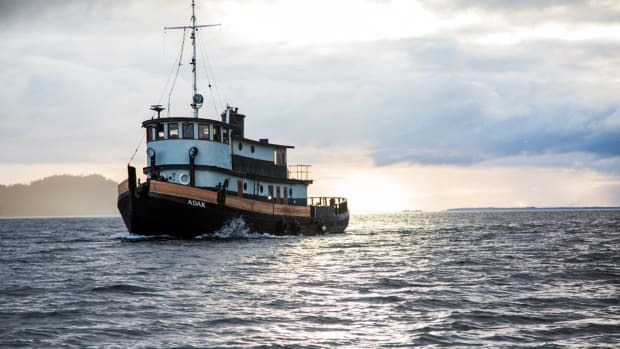 Although we’d long been interested in the Nordhavn 47, the increased fuel capacity, extended cockpit, and boat deck of the 52 made it just that much more suitable for us. During our travels, we’ve found the size has worked well and we’ve not felt we needed a larger, or smaller, boat. We’ve been able to fit into marinas that had little space and wouldn’t have been able to accommodate a larger boat. In Fiji, for example, we were able to get a last-minute spot at a marina that couldn’t accommodate an earlier-arriving Nordhavn 57 and a 62. And the new marina in Reunion will not take boats longer than 17 metres (56 feet). The only time we’ve felt the boat was almost too big was in Richards Bay, South Africa, where the docks are not suitable for boats weighing over 30 tons. Dirona weighs 55 tons but, having watched the Richards Bay docks break apart and sink in a storm, we’re not convinced they are suitable for 30-ton boats either. 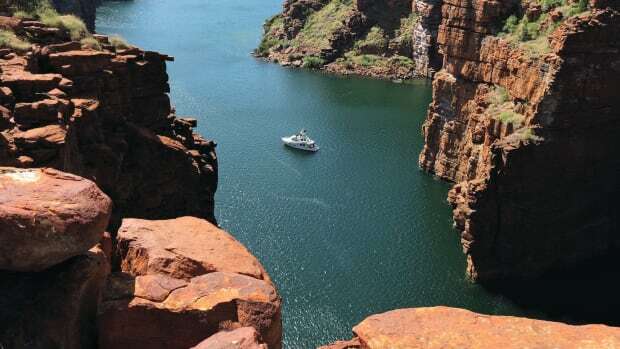 A larger boat certainly would have some advantages, such as more space and fuel capacity with increased speed and range, but at a higher purchase and maintenance cost. Diving to clean the bottom has always been a good way to remind ourselves that we don’t want a bigger boat. Speed and range is always an appeal for us, so choosing the “right” size boat is a decision with many trade-offs. For longer trips, we have increased our speed and range through on-deck fuel bladders that can carry an additional 960 gallons. 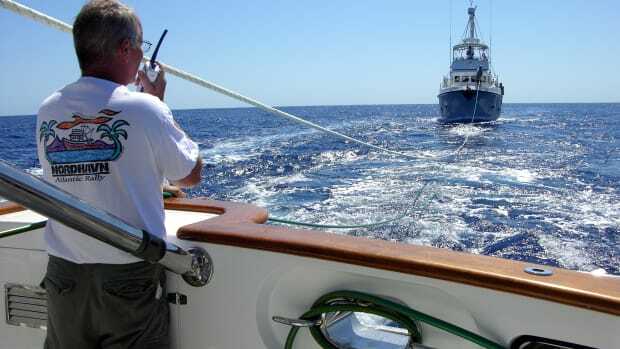 This allowed us to make a 3,689 passage from St. Helena to Barbados at an average of 6 knots in 25 nights. Dirona carries 1,747 gallons and can easily cover 2,000 miles at nearly 7 knots. For longer trips, we increase our speed and range with on-deck fuel bladders that add 950 gallons. This allowed us to make a 3,689 passage from St. Helena to Barbados at an average of 6 knots in 25 nights. Without that extra fuel we’d likely have had to run at closer to 5 knots, or nearly an additional week at sea. We’re generally happy with how the boat is rigged and don’t feel the need to make any major changes at this point. We haven’t yet come up with a convenient system for getting on and off the boat when side-tied to a high, fixed dock, however, and wished we’d specified a boarding door at the pilothouse level during the build. Even that wouldn’t help with berths such as the ones in Florida, where we were backed into a fixed-height berth that didn’t extend beyond amidships. We would prefer a higher-horsepower wing engine to power the hydraulics and stabilizer fins that are closer to 9 square feet rather than our 7.5 square feet, but were unable to arrange those upgrades. A few items we considered installing and in retrospect are glad we didn’t: One is replacing the standard Sub-Zero refrigerator with a custom model that used a more efficient, remote 24-volt compressor. The custom units generally don’t control humidity as well as a standard fridge, however, and the Sub-Zero keeps food exceptionally well. With a few tricks on our part, we can keep lettuce fresh for over six weeks. We’re happy to spend a little bit of diesel to have fresh produce. Most cruisers we talk to really prefer more power-efficient options but the longevity of fruits and vegetables has us won over. We really like the Sub-Zero and don’t mind the extra amps consumed. We’d also planned to include built-in storage for engine oil and tender gas, but couldn’t come up with a good placement. We instead went with two 29-gallon, wheeled gasoline tanks secured on the boat deck and five-gallon pails of oil stowed in the engine room. In retrospect, built-in oil tanks probably wouldn’t have worked as well, because they require used oil to be pumped from the engine into the storage tank and then into empty pails for disposal. New oil delivered in pails is pumped into storage tanks and then into the engine. We cut the pumping in half by just storing the oil directly in the five-gallon containers we normally buy. On tender fuel, we often refuel our boat at docks that sell only diesel. Several times we wheeled our portable tank to an automotive service station, and sometimes transported it in the dinghy. In Darwin, the nearest gas station was so far we drove the tank to a gas station by rental car. The only major piece of equipment that we installed and haven’t used, nor are likely to, is a hinged stack. We specified this to allow us to pass under the 19-foot, 1-inch fixed bridge across the Chicago Sanitary and Ship Canal so we could do the Great Loop. We remain interested in doing the trip, but it might not be in the current boat. Dropping the stack on Dirona is possible, but would require a crane and some electronics removal and wire placement adjustments. Overall Dirona has been a wonderful home for us over the past seven years and has far exceeded our expectations. But we’re not done yet. We plan to cross the Atlantic again this year and spend the next few years cruising northern Europe, including the British Isles, Norway, and the Baltic Sea. About the authors: Jennifer and James Hamilton are authors of Waggoner companion guide Cruising the Secret Coast: Unexplored Anchorages on British Columbia’s Inside Passage. They have been cruising under power since 1999 and moved aboard full-time in 2009. In 2016 they completed a four-year trip around the world in their Nordhavn 52, Dirona. They maintain a blog at mvdirona.com focused on trip highlights, mechanical systems, and equipment and approaches they’ve found useful. The site also includes a live map showing real-time boat location, current weather, fuel-on-hand, and current fuel consumption rate.